I've decided that I am one of those people who doesn't know how to truly relax. 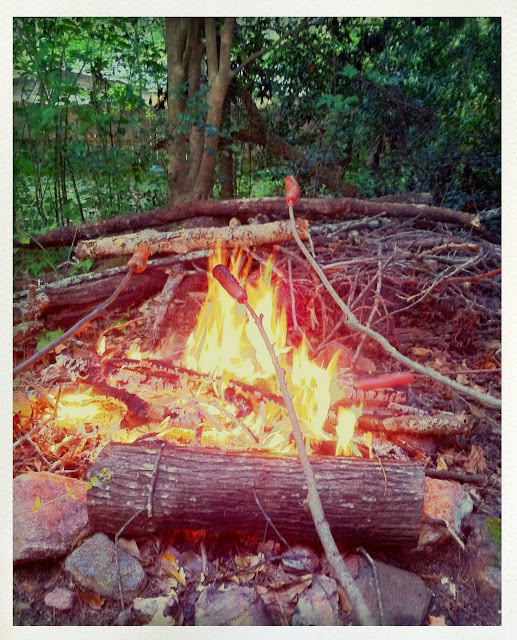 After finishing up with the baby shower yesterday I felt we needed to run all of our errands, go treasure hunting, walk Bono Baby, and accept an invitation to an impromptu back yard weenie roast. Man oh man, that tofu dog and s'mores made my heart happy. I have so many plans and projects and to do lists running through my mind and I feel this desperate push to get them all finished before Baby Coco arrives. Thank goodness, I am finally feeling better (knock on wood) and my energy is coming back. For me, there is nothing more frustrating then thinking of all the things I need to do and not having the energy to do them. So, just so you know, if I owe you an email or a package or a thank you note, I am working on it and I am thinking about it always. My Daniel gifted me all of the Grey Gardens films (I love love love those ladies) for Christmas last year and I have been waiting for the perfect relaxing day to sit about and watch them all. I imagine it will be like one of those days in my 20's where I would indulge in all six hours of the A&E version of Pride and Prejudice. I should say six and a half hours of it because I am pretty sure that I re-round the scene where Mr. Darcy takes a swim in his pond a number of times. Who can resist seeing Mr. Darcy in a wet shirt over and over? Anyhow, I've decided to reward myself with my perfect Grey Gardens movie marathon day before Baby Coco arrives. I'm going to make it the most relaxing, perfect day ever. What would you choose to do on your relaxing day? The day you save up for yourself to enjoy after you finish all of your to do's? p.s. Pregnancy has made me super chatty and open to spill all of my secrets and thoughts. I just can't seem to help myself. oooo now i want to watch all six hours of pride and prejudice. my husband is out of town so it the perfect opportunity! my favorite relaxing thing to do is take a really really long bath and read, then get into bed and read. i especially love it if i can stay in bed and read after i wake up in the morning. that feels super luxurious to me. Glad you're feeling more energetic. Blessings! I think I agree with Rae, a really really long bath sounds great, the kind where my kids don't knock on the door and need me to do something 3 separate times. Instead, I think I will try to take a nap while my kids do...I deserve it. I think mine would involve films too though - probably a pixar marathon and lots of tea and blankets, possibly even keeping my PJ's on all day lol.